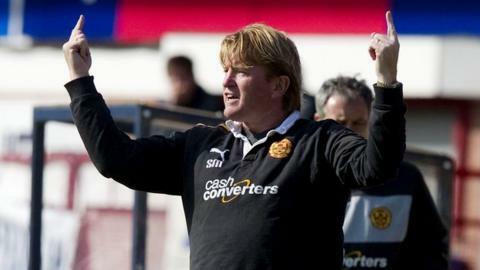 Motherwell boss Stuart McCall insists his players will not get carried away despite sitting top of the league. The Steelmen remain top after coming from behind to defeat Dundee by two goals to one at Dens Park. "I've no interest in that if I'm honest, it's just amassing points." The former Rangers midfielder told BBC Scotland's Sportsound. "I'm delighted to get the three points today." Colin Nish fired Dundee ahead to leave Motherwell trailing at half-time, but McCall always felt his side could come from behind to claim the three points. "We said at half-time if we could just up the tempo a wee bit, we could go and win the game," he said. "Let's not look to try to draw, let's look to win it." A double from Michael Higdon saw Well claim victory, and the striker was praised for his display. "Two fine goals, but his all round performance," McCall added. "I think he gave the two young lads a really tough time at the back." The former Bradford boss felt the introduction of Henrik Ojamaa was the key moment in the match. "With playing Jamie Murphy up top, Jamie sometimes likes to drift, which we don't mind him doing and getting out wide," he said. "I just felt we needed a change and Henrik [Ojamaa] plays a little bit nearer to Michael [Higdon]." Motherwell and Ross County are the only unbeaten sides in Scotland's top flight. "I've got that luxury at the moment because a lot of people are playing well, I've got a dilemma on the bench."